Objectives To define the prevalence of severe chronic fatigue syndrome/myalgic encephalomyelitis (CFS/ME) and its clinical characteristics in a geographically defined area of Northern England. To understand the feasibility of a community-based research study in the severely affected CFS/ME group. Design A two-phase clinical cohort study to pilot a series of investigations in participants own homes. Setting Participants were community living from the area defined by the Northern clinical network of the UK. Participants Adults with either a medical or a self-reported diagnosis of CFS/ME. Phase 1 involved the creation of a database. Phase 2: five participants were selected from database, dependent on their proximity to Newcastle. Interventions The De Paul fatigue questionnaire itemised symptoms of CFS/ME, the Barthel Functional Outcome Measure and demographic questions were collected via postal return. For phase 2, five participants were subsequently invited to participate in the pilot study. Results 483 questionnaire packs were requested, 63 were returned in various stages of completion. 56 De Paul fatigue questionnaires were returned: all but 12 met one of the CFS/ME criteria, but 12 or 22% of individuals did not fulfil the Fukuda nor the Clinical Canadian Criteria CFS/ME diagnostic criteria but 6 of them indicated that their fatigue was related to other causes and they barely had any symptoms. The five pilot participants completed 60% of the planned visits. Conclusions Severely affected CFS/ME individuals are keen to participate in research, however, their symptom burden is great and quality of life is poor. These factors must be considered when planning research and methods of engaging with such a cohort. Two-phase pilot study with severe chronic fatigue syndrome/myalgic encephalomyelitis (CFS/ME) individuals in the community, to understand the feasibility of engaging those with severe CFS/ME with research. Functional Outcome Score and De Paul fatigue questionnaire. Effort was taken to engage with this severely symptom burdened group in their own environment. The postal questionnaires sent to return ratio was poor; feedback from the local support group suggests in part due to the severity of impairment experienced by this group of individuals. This pilot study can only give an indication of possible people with severe CFS/ME presentation in a specific, geographically defined area. Approximately, 0.4% of the population is affected by chronic fatigue syndrome/myalgic encephalomyelitis (CFS/ME).1 A disabling condition which is difficult to diagnose because of variations in aetiology2 and a lack of biomarkers.3 Owing to the absence of biological-based diagnostic markers, a series of clinical diagnostic criteria have been created to aid diagnosis. One such criteria is the Fukuda diagnostic criteria,4 which defines CFS/ME as new, unexplained 6-month history of fatigue, with four or more of the following symptoms: impaired memory or concentration, sore throat, tender cervical or axillary lymph nodes, muscle pain, multijoint pain, new headaches, unrefreshing sleep and postexertional malaise (PEM). The Canadian criteria5 evolved from the Fukuda criteria. A more defined criteria requiring persistent illness for 6 months, with the symptoms of fatigue, PEM, sleep dysfunction and pain. In addition, two or more neurocognitive expressions plus the presentation of symptoms from autonomic, neuroendocrine or immune system. The problem with such criteria is that it produces broad constructs which overlap and create divergence in symptoms. This inclusive criteria do not allow for the selection of a homogeneous research population.6 The International Consensus Criteria were devised in 2011 based on current knowledge to distinguish unique characteristics of symptom patterns.6 These criteria recognise the heterogeneity of the condition and suggest the use of subgroups to allow for comparison of patients within research. Here, we describe a cohort severely affected by CFS/ME. To define the prevalence of severe CFS/ME in the Northern region of the UK. To explore the quality of life, symptom burden and impact of severe CFS/ME in a selected pilot study cohort. The prevalence of CFS/ME has been defined in three regions of England13; however, this study did not subgroup patients into severity categories and so prevalence of severe and very severe CFS/ME individuals remains undetermined in any region of the UK. Based on the population data from the region covered by the Northern clinical network, there are just over 2.5 million people living in the region.14 It can therefore be estimated that approximately ten thousand people suffer from CFS/ME.10 11 If ME Research UK projections are correct between one thousand and two thousand five hundred of those individuals would suffer with such severe CFS/ME that they were housebound, wheelchair users or bedbound. The research question was developed with advice from ME Research UK,10 who are acutely aware the severely affected CFS/ME patient group are severely overlooked; ‘just ignored and invisible’.16 The regional charity ME North East was heavily involved in the evolution of the project and helped significantly to access patients to promote the project. This group of patients are difficult to reach9 and are therefore an unknown quantity. Due to the severity of their presentation, they cannot access outpatient settings and are too ill to attend support groups, where opinion could be reached. Therefore, a pragmatic approach was taken when considering outcome measures used. Four support groups were visited in the region and feedback sought as to project methodology. Although all attendees to the groups were mildly to moderately severe, several had experienced the severe and very severe presentation of the condition during their illness. The response was uniformly in favour of a domiciliary approach. The opinion being it would be impossible for the most severe individuals to leave their homes and in some cases bedrooms. The patient groups and charities were involved in promoting the study to those hard to reach, severely and very severely affected CFS/ME individuals. The groups provide a point of contact for those who are housebound. The first aim was to scope the prevalence of the severe and very severe population in the Northern region. The second aim, was to translate a previously successful MRC project, directed at mildly and moderately affected CFS/ME participants, to a domiciliary setting. The intention was to take advice from the participants, on a minute to minute basis, during project delivery as to what they felt they could manage during the home visits. The achievement of the outcome measures was fact finding; not necessary to the success of the study, but a mechanism to understand the obstacles and burdens experienced by this severely affected group. Ongoing communication with ME North East alerted us to the burden the participants felt having to express interest in the study via telephone or email. Therefore, with ME North East’s support, ethics were altered to allow the questionnaire packs to be sent to ME North East. The charity addressed and sent the packs out directly to the 425 members who had been identified as severe and very severe, with the option of being involved or not. Communication with ME North East and ME Research UK has been ongoing throughout the process with update reports being published for participants to access on line. This will continue until all the data have been analysed and published. Participants were over 18 years of age with a medical or self-identified diagnosis of CFS/ME who were house, wheelchair or bed bound. 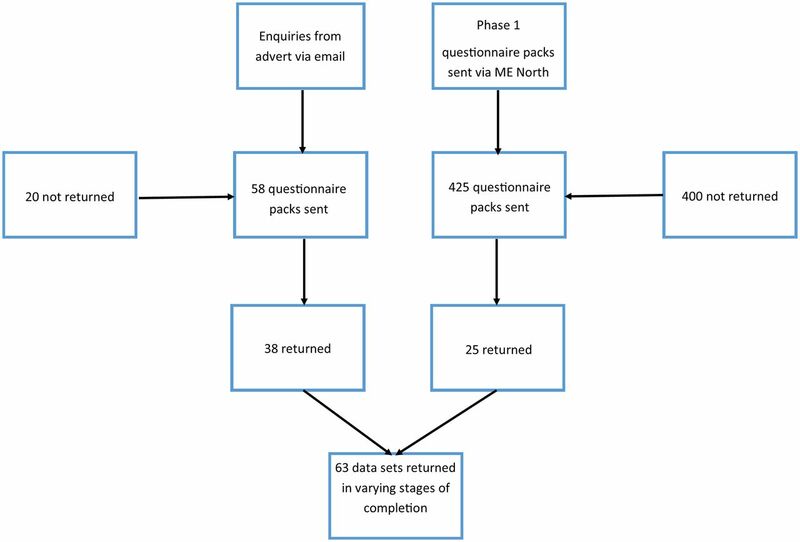 The self-reported diagnosis process has been used elsewhere.11 The individuals engaged from their own homes initially via postal questionnaires and return of an expression of interest form indicating their willingness to participate in phase 2 and future studies. The initial phase of the project was advertised in GP practices, the five local CFS/ME services and national charities and via social media. The project was also promoted by visiting each of the five services and several of the local support groups. Fifty-eight people volunteered to take part and were sent a questionnaire pack that contained four items: an expression of interest and three questionnaires. Despite this, questionnaire return was poor. Permissions for a change in protocol were granted following advice from the local charity ME North East. The charity identified those members known to be severely affected by CFS/ME and questionnaire packs were sent directly from them. The shorter De Paul fatigue questionnaire and the Barthel were chosen over the De Paul Symptom questionnaire and the 36-Item Short Form Survey,21 for ease, given the severity of the population group. The case definitions were modified to allow this specific analysis. For the Fukuda criteria, participants needed to report four of the eight possible symptoms at the frequency threshold equal to or greater than seldom and severity greater than 25. For the Canadian criteria, participants needed to report fatigue, PEM, sleep dysfunction, pain and neurocognitive issues, as well as symptoms from two of the following three domains: autonomic, neuroendocrine, immune (ie, symptoms from seven domains total) at a frequency equal to or greater than often and a severity greater than 50. Participants returned the above questionnaires in various stages of completion, depending on their capability at the time. These data allowed the creation of a database of severely affected CFS/ME individuals in the Northern region of the UK. It was from this database that individuals were selected for phase 2 of the project. Phase 2 involved five participants from the Newcastle area being selected from the database to be involved in a series of home visits to collect data. 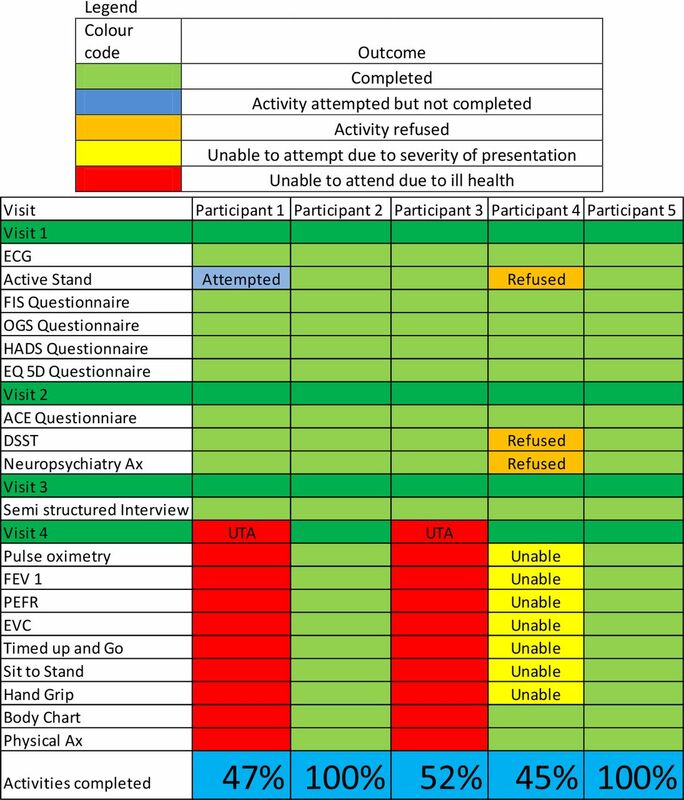 Part of the data mapped directly to an MRC-funded study that was carried out in our outpatient facility.15 Four visits were planned to be completed within a 3-month period to control the burden on this physically limited group of individuals. The five participants were given a second consent form and patient information sheet specific to phase 2. All five participants consented to have details collected from phase two published in a peer-reviewed journal. In total, 483 questionnaire packs were posted. Four hundred and twenty-five were posted via ME North East to their members who were known by the charity to be severely affected. Of the questionnaires sent out, 63 datasets were returned in various stages of completion,25 of which were from the ME North East cohort. The recruitment process is shown in figure 1. Flow diagram showing recruitment. ME, myalgic encephalomyelitis. Of 63, 56 (89%) of phase 1 participants were female with a mean age of 53 years (range 21–80). Of 63, seven (11%) were male with a mean age of 51 years (range 36–68). Fifty-six De Paul fatigue questionnaires were returned, of which 34/56 (60%) of those questionnaires returned fulfilled both the Fukuda4 and Clinical Canadian Criteria6 and called the yes group. Of 56, 10 (18%) fulfilled either Fukuda4 or Clinical Canadian Criteria6 but not both, the yes/no group. Importantly, 12/56 (22%) of the individuals who returned the De Paul questionnaire did not fulfil either Fukuda or the Canadian criteria, ‘the no group’. Using these three groups, we then went onto explore whether demographic details to responses to the De Paul questions might predict whether an individual did, or did not, fulfil one, both or neither CFS/ME criteria. Table 1 shows the characteristics of the De Paul population. Demographically, each group was similar when broken down. However, although the majority were experiencing fatigue, not all participants perceive the reason for their fatigue to be due to CFS/ME. In the group who did not comply with either criterion, 50% felt their fatigue was related to some other cause. Whereas, those who did comply with the criteria, 53% felt CFS/ME was the cause of their fatigue, while 41% attributed their fatigue to some other cause. There was no discernible pattern of onset between any of the groups, (question 2). All three groups had reduced their occupational, social and family time significantly, the yes group not being quite as affected as the yes/no group and not CFS/ME groups (question 4b, c). All three groups found it difficult to manage their fatigue with little or no benefit from resting, requiring varying amounts of rest to feel relief and most experiencing return of fatigue immediately on starting a new activity (question 5a, b). Unsurprisingly, the majority of each sub group restricted their activity; physical activity making them feel worse, again in all the subgroups (questions 6 and 7). High proportions of each sub group experienced PEM, lasting for more than 24 hours (question 8). Each group had low perceived amounts of energy and high fatigue ratings (questions 9–14). When asked as to the course of their illness, no one responded constantly improving (question 15). The 71 symptoms documented in the De Paul Fatigue Questionnaire were analysed as to whether they complied with the Fukuda and Canadian CFS/ME criteria. The participants were analysed within their subgroups: who fully complied with both criteria, the yes group; who partially complied with the criteria, the yes/no group; and those who complied with neither criteria, the no group. Those who complied with both criteria, the yes group, experienced most symptoms (mean 39.9, SD 11.1). While those who do not comply with either criteria, the no group, barely experienced any of the symptoms (mean 1.08, SD 1.75). Those participants who complied with one but not both criteria, the yes/no group, symptoms experience fell between the two conclusive groups (mean 24.1, SD 6.7). Table 2 shows the breakdown of comorbidities reported as a response to question 16. Fifty-six questionnaires were returned and over 70 different comorbidities were recorded in addition to the self-reported diagnosis of CFS/ME. Figure 2 shows the participation and completion rates of phase 2. Three of the five phase 2 participants completed all the visits. Between 45% and 100% of the assessments were completed by the volunteers. Participant 1 attempted the active stand; however, it was abandoned after 90 s by mutual agreement. The subject’s heart rate increased above 120 bpm, pallor deteriorated and they began to experience significant orthostatic symptoms. The completion of interventions in phase 2. DDST, Digital Symbol Substitution Test; EVC, Expiratory Vital Capacity; EQ-5D, Euroquol 5 dimension; FEV1, forced expiratory volume in 1 s; FIS, Fatigue Impact Scale; HADS, Hospital Anxiety and Depression Score; OGS, Orthostatic Grading Scale; PEFR, Peak Expiratory Flow Rate; UTA, Unable to Attend. Participant 4 refused to complete several neurocognitive questionnaires in part due to cognitive impairment. However, participant 4 became very upset when confronted with the extent of their cognitive impairment and was unable to complete the digital symbol substitution test and the neuropsychiatry assessment. Participant 4 also declined to complete the active stand in visit one. However, on examination in visit 4, it became apparent that the active stand and many of the activities in visit 4 would have been impossible to perform. It was reasoned that extensive bilateral adaptive shortening in their Achilles tendon, mid and hind foot due to prolonged bed-rest would have prevented standing. Finally, the non-attendance of participants 1 and 3 for visit 4 was due to ill health. In the case of participant 1, they had been impeded by personal ill health, ill health of their preschool child and finally a family bereavement. These multiple burdens were experienced alongside severe CFS/ME throughout the 3-month time frame. The study actively recruited severely affected individuals for 9 months. In that time the goal to select five individuals necessary for phase 2 was attained, allowing the translation of components of the MRC study into a community setting. Recruits to phase 1 also consented to be contacted for future research opportunities. This project proved it is feasible to engage severely affected CFS/ME individuals in research. Twenty per cent of the predicted 2500 severe CFS/ME population in the Northern region were identified. Approximately, 2.5% of the predicted severe CFS/ME population in the Northern region engaged with this study and were characterised. This demonstrates that despite the significant functional and cognitive impairments experienced by this group, there is the motivation to be involved in research. The study showed that questionnaire completion was the task that was most consistently achieved. Of the 63 recruits, 88% (56/63) completed the De Paul questionnaire and 76% (48/63) completed the Barthel Functional Outcome Score. However, from feedback from ME North East suggested with increased support to the participants, more could be realised. This pilot study demonstrates, as others have previously22–24 that it is possible to engage severely affected CFS/ME individuals in research, although there are some complexities and it can be difficult.12 The project was limited in its ability to access individuals. Despite employing various mediums, people with severe CFS/ME must also have the ability to access the same mediums. Therefore, some cases may have remained unidentified. The number of severely affected self-reported CFS/ME individuals recruited is a small proportion of the predicted figure of two thousand five hundred. This useful small-scale study will add to the growing body of evidence about severe CFS/ME. However, it must be acknowledged that this paper can simply indicate the number of people thought to be affected by the severe expression of CFS/ME and highlight the difficulties this population experience. In doing so, future studies can be improved on, giving people with severe CFS/ME the opportunity to engage with research. It is understood that individuals with CFS/ME often experience cognitive impairments alongside their physical impairments.6 Feedback from ME North East clients expressed the difficulties they had concentrating on the questionnaires and supporting governance paperwork. This created obstacles to engaging with the study. Another problem highlighted by ME North East was for some individuals their ability to function was so precarious, they felt disturbing their fragile home life balance by introducing a new task, such as document completion, may create a relapse in their condition. Paperwork was kept to the minimal requirement to comply with ethics and limit the burden on this research population. Both the De Paul fatigue and symptom questionnaires are complex, to accommodate the multifaceted nature of the condition and the many symptoms and pathways that produce the illness. The inclusion of the De Paul was essential to verify the CFS/ME diagnosis and confirm that the correct individuals were being identified. Twenty-two per cent of the individuals who believe they have CFS/ME do not comply with either the Fukuda or Clinical Canadian Criteria. These group appear to experience symptoms differently to those who comply with both criteria, as they barely had any symptoms, and 50% reported their fatigue was related to some other cause. This pilot study has demonstrated that people severely affected by CFS/ME can be engaged with research with some success and more investment to research severely affected CFS/ME individuals needs to be undertaken. Fatigue is disabling and people experiencing it need more support during the research process. Severely affected CFS/ME individuals have cognitive impairments, alongside their physical limitations and may need help navigating the research process. The development and implementation of research advocates to facilitate the research process may help to engage and recruit severely affected CFS/ME individuals into relevant studies. These data show that some individuals in the community believe they have CFS/ME without fulfilling criteria to be diagnosed with the condition. As this occurred in only 12 of 56, and half of them indicated that something other than fatigue caused their problems, it does appear that most individuals with CFS/ME were identified by the assessment instrument. It is necessary to acknowledge that individuals with multiple comorbidities and overlapping symptoms may conform to the definition of complex disability.25 In doing so they must be afforded the resources of such a category. It is important to understand severely disabled individuals within the context of the International Classification of Function and Disability.26 27 This holistic approach would allow identification of all the biopsychosocial28 29 factors that make certain people more susceptible to the severe expression of CFS/ME and other outcomes. Research has identified that suicide specific, standardised mortality rates are higher in the CFS/ME population group compared with general population.30 Through early identification of those vulnerable to significant deterioration and other risk factors, the development of holistic management and prevention strategies could be made to limit the impact of the illness. We thank ME Research UK for funding the study that allowed this pilot project. We would also like to thank ME North East, all the local support groups and the participants who contributed to this study. NICE. Chronic Fatigue Syndrome/ Myalgic Encephalomyelitis diagnosis and Management in Adults and Children. 2007 http://www.nice.org.uk/guidance/cg53.
. Myalgic encephalomyelitis/chronic fatigue syndrome: clinical working case definition, diagnostic and treatment protocols. Journal of chronic fatigue syndrome 2003;11:7–115.
. Severe and very severe patients with chronic fatigue syndrome: perceived outcome following an inpatient programme. Journal of Chronic Fatigue Syndrome 2000;7:33–47. Pathways through participation. Briefing Paper no. 3 - Who participates? Briefing Paper no. 3 - Who participates? 2009.
. Severely affected ME/CFS patients a geographically defined study. 2014 http://www.meresearch.org.uk/our-research/ongoing-studies/severely-affected-me-patients/. North East: Census Profile. The Migration Observatory informs debates on international migration and public policy. 2013 http://www.migrationobservatory.ox.ac.uk/resources/briefings/north-east-census-profile/. Group, C.M.W. A report of the CFS/ME Working Group: report to the chief medical officer of an independent working group : Department of Health, 2002.
. Risk factors for the development of severe ME/CFS - A pilot study. Journal of Chronic Fatigue Syndrome 2004;12:47–50.
. Feasibility study for a community based intervention for adults with severe chronic fatigue syndrome/ME. BMC Complementary and Alternative Medicine 2017;17(Supl. 1):317. NHS England. NHS Standard contract for specialised rehabilitation for patients with highly complex needs (all ages). 2013 https://www.england.nhs.uk/wp-content/uploads/2014/04/d02-rehab-pat-high-needs-0414.pdf. World Health Organization. International Classification of Functioning, Disability and Health: ICF, 2001. Contributors Study concept and design: JLN and VJS. Acquisition: VJS. Analysis or interpretation of data: VJS, JLN, MS and LAJ. Drafting of the manuscript: JLN and VJS. Critical revision of the manuscript for important intellectual content: all authors. Statistical analysis: VJS, JLN and MS. Obtained funding: JLN. Administrative, technical or material support: JLN and VJS. Study supervision: VJS and JLN. Funding This study was supported by ME Research UK HG/MC/136149. Disclaimer The funders approved the study design but had no other role in the collection, management, analysis and interpretation of the data or preparation of the manuscript for submission. Ethics approval Ethical approval was granted by Newcastle and North Tyneside 2 Research and Ethics Committee. Data sharing statement Access to data available on request (victoria.strasshiem@ncl.ac.uk).